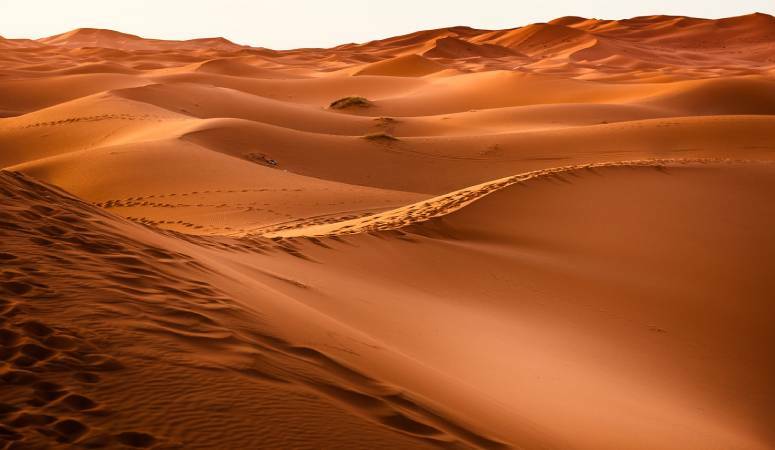 If you are yearning for the tranquility of a desert night sky along with the beauty of Sahara then Zagora is your go-to destination. 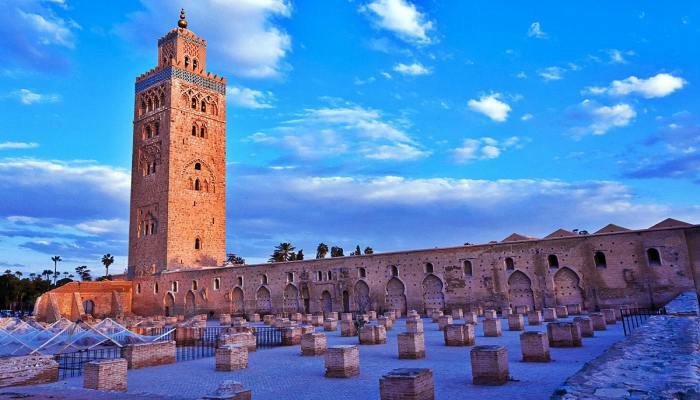 This desert city is emerging as a prominent destination for tourists visiting Morocco. Located in the Draa Valley in South-eastern Morocco, this city gets its name from the Zagora Mountains that it is flanked with. 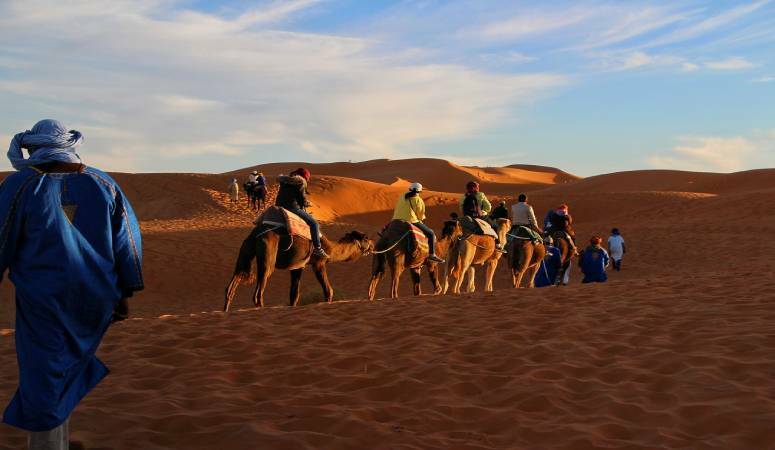 Visiting Zagora can be an enchanting experience, especially Camel trekking in Zagora along with sandboarding can be rated as the best Dessert experience. Every night at Zagora is simply unique and memorable. Enjoy the desert, away from the regular hustle and bustle of the city. 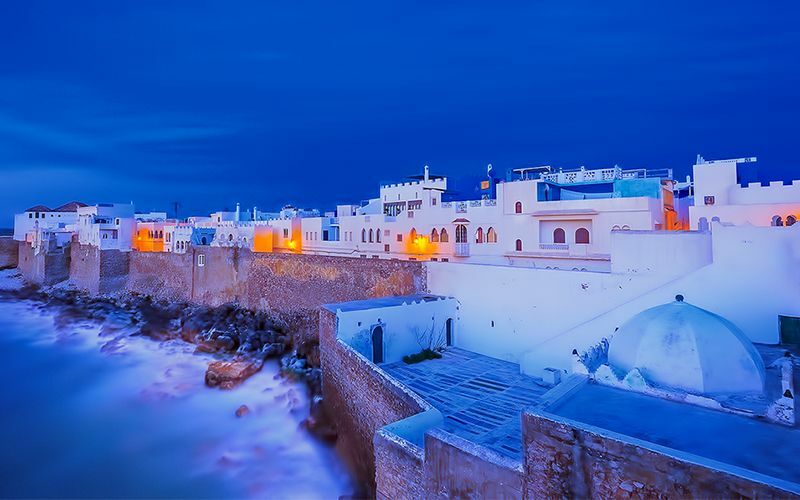 Indulge yourself in an unforgettable cultural experience in Morocco. A variety of artistic shows are performed by the Arabs and Amazighs in the area, these shows vary from Hassai rhymes to Ahidous and Regba. This involves riding camels, touring orange-hued sand dunes. 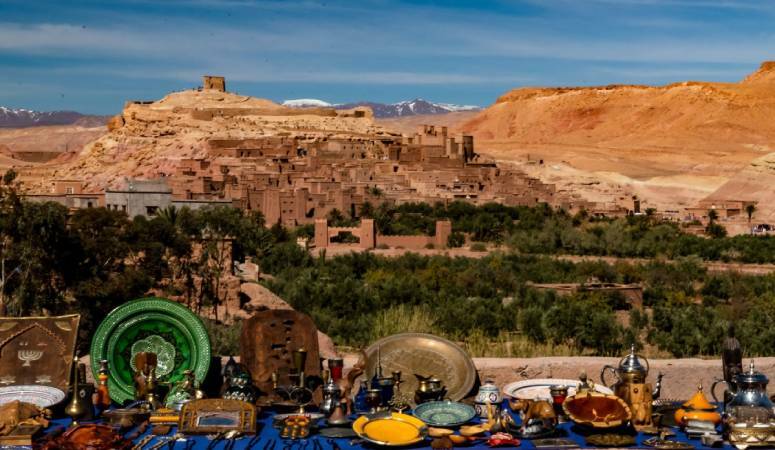 Visitors get to view not only the dunes but also get to see the Atlas Mountains, an unusual sights combinations that would make your trip truly memorable! The view and the experience from the camel ride is part of the desert culture, blended with friendly locals and beautiful food. Have you heard of Sandboarding! If you are a free-spirited adventurer looking for fun then try sand boarding. Get the adrenaline rush by a perfect combination of sand, sun and surfing; a fun-filled ride across the desert dune’s face. 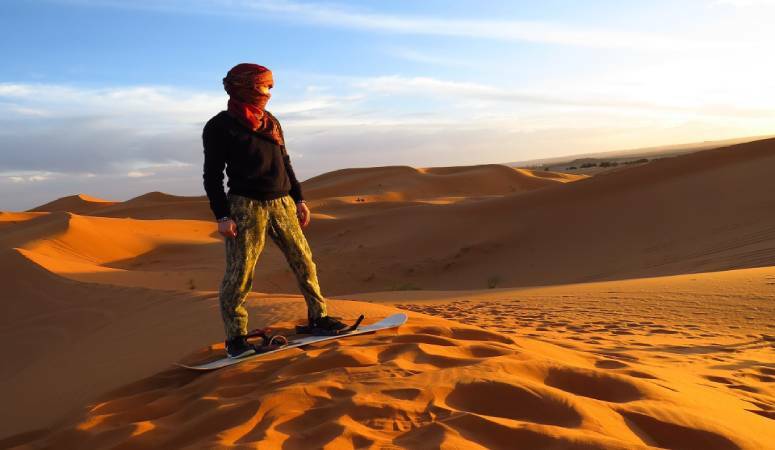 Travelers can book a separate sand boarding tour or incorporate it into their existing tour packages. The sunrise and the sunset in Zagora desert are spectacular; a clear night sky with countless stars over the wide horizon. Desert camping in Zagora is an amalgamation of Moroccan food, hospitality, nomad culture and life. You can also go mountain climbing on Jebel Zagora. The Zagora Mountain is 3000 feet high and showcases Roman ruins led by small passageways. About forty-five minutes from the city are huge Roman ruins which are mostly under-visited. You will notice ancient Kasbahs and villages while passing by the mountain. Most of the homes are uninhabited, though a few might still be inhabited. The local market is lively and worth visiting. It offers a variety of products. From fresh fruits and vegetables to poultry, silver jewelry, artwork, souvenirs and gear needed for desert camping is easily available. After a fulfilling day of exploring Zagora, indulge yourself in Authentic Moroccan food for a wholesome experience. The food is a combination of heritage from Arabic, Mediterranean, West African and Jewish influence, fused to create an unforgettable combination of flavors. Don’t forget to try Couscous, Moroccan number one meal, and get a sip at Moroccan mint tea!. Besides this you can take a stroll by the majestic Draa valley river. Be sure not to skip the famous festivals such as Moulay Abdulkadir Jilali’s mousseum. Your trip to Zagora is bound to end with a treasure of pleasant memories to take back with you.